Ros told us that her brother took their father to Italy a few years ago to see his brother Geoffrey’s grave for the first and only time. This was obviously a very sad but fulfilling experience for their father. Ros has also very kindly provided us with the above photograph of her uncle, Geoffrey Stevens, as well as a picture of his grave along with a few background notes. We already knew him by name since the Plaque was first put up in our Linden Road Church. However the picture of Geoffrey and the additional information about him, from Ros, brings home to us a more personal awareness of the character of this young man. He was the third son of Frederick Augustus (commonly known as Gus) and Daisy Dora Stevens and was born on 26th May 1922 at 10 Mons Avenue, Bognor Regis. He was a member of the 1st Bognor Regis (Congregational) Company of the Boys Brigade for many years and joined the 5th Battalion Grenadier Guards in 1942. He fought with them through Tunisia, Egypt, Sicily and Italy and was involved in the Battle of Anzio in 1944. He died at La Quercia, North Italy on 30 October 1944 whilst defusing a booby-trapped land mine. 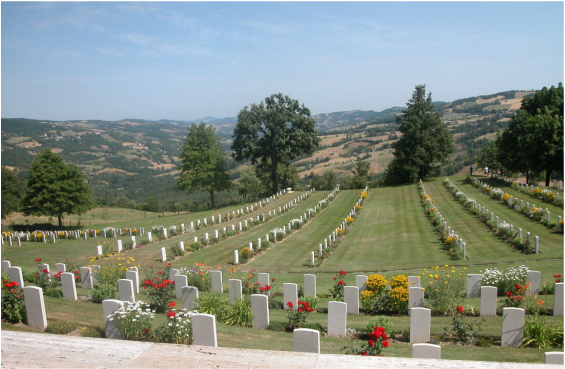 He was buried in the Castiglione South African Military Cemetery, Italy. Roy Francis Hawkins was born in 1925 in Bognor and was in the 2nd Battalion Hampshire Regiment. He died on 4 Dec 1944 and is buried in the Faenza War Cemetery, Italy. Albert Harold Hooper son of George Henry and Anne Sarah Louise Hooper of Bognor Regis was in the Royal Armoured Corps, 2nd Derbyshire Yeomanry and was involved in the D-Day landings. He died 18 June 1944 and is buried at La Delivrance War Cemetery, Douvres, France. with sorrow humility and pride.